Welcome to The Empowerment Cafe. Our unique cafe serves up excellent recipes that enhance daily life with improved communication, strengthened relationships, increased happiness, health and financial well-being. Our collection of recipes, or trainings are specially formulated, making it easy enough for a child to follow, yet comprehensive enough to transform the most complex life situations. Each recipe incorporates our secret ingredients: The Empowerment Principles. These principles are a special blend and mix of the finest, most renowned confidence, empowerment, and human behavior skills on the market today! Our recipes remove the time and effort of getting the results you want by providing the proper measurements of The Empowerment Principles and a step by step instruction guide. People of all ages and professions have benefited from our recipes since 2003. They help disengaged students improve their attendance and grades, couples deepen their commitment to their relationship, and parents effectively communicate to better serve the needs of their children. This is just an example of what can be accomplished with our recipes. Having studied social and human behavior for over thirty years I know how difficult it can be to apply the knowledge being conveyed by the scholar. This became my motivation to create these Life-Enhancing Recipes. Most people know what results they are trying to achieve, yet manifesting it can be challenging. A recipe removes the doubt of how to achieve a desired outcome. It is like baking a batch of cookies from scratch. Unless you have done it enough and have memorized the recipe to ensure the success of a batch of cookies, a recipe is vital. 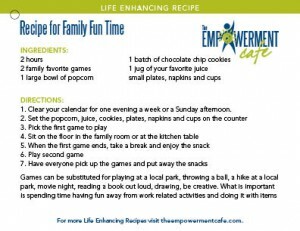 The recipes from The Empowerment Cafe provide the reassurance of a successful outcome, just like a cookie recipe ensures a great tasting cookie. Our recipes are taught as an Appetizer, Side Dish, or as an Entree. An Appetizer gives a brief understanding of the topic and a quick overview of how to use the recipe. A Side Dish provides a deeper understanding of the topic and time to practice using the recipe. An Entree teaches all The Empowerment Principles, the ingredients necessary to achieve desired results. A dessert teaches the techniques to properly mix and blend The Empowerment Principles into daily life. We offer our Life-Enhancing Recipe trainings throughout the month and at various locations within our serving area. Click here to view our upcoming trainings. Catering a recipe training for your group or organization is a great way to help them achieve their desired results of healthier, happier life! Dolores talks with Mary Helen and Carol of Retiree Rebels about how retirees on a new unscripted path of life can regain their footing and move forward with confidence.